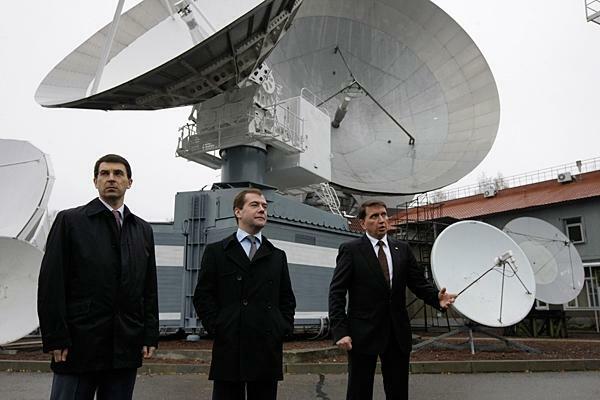 In 2009 Russian President Dmitry Medvedev (center) called for resources to build a nuclear-powered spaceship (Credits: RIA Novosti/AP). Russia plans to develop a nuclear propulsion system that will be available in 2017, and will be capable of supporting interplanetary space missions by 2025. If Russia is able to harness nuclear energy to power long duration space missions by 2025, it would give them a significant lead in the modern space race. Nuclear energy has significant advantages for deep space missions, in which the ability to carry fuel is a limiting factor in determining a mission’s duration. Solar power can be used for extended missions within the inner Solar System, but outer system missions are too far from the Sun to make this a practical energy source. Nuclear energy can be used in two ways in powering propulsion systems: either its energy can be used to generate heat that is turned into energy or it may provide power directly. Russia is targeting this latter technology for development. They plan to use a nuclear reactor to power an electric ion propulsion system. The engines will be propelled by an ion flow that is then accelerated with an electric field. The propellant for the engines will be Xenon. In 2003 NASA’s nuclear fusion power spacecraft project “Prometheus” was developed. According to the team leader of the project, Bill Emrich, an Engineer at NASA’s Marshall Space Flight Center in Alabama U.S., “the energy fusion drive would generate 300 times the thrust of any chemical rocket engine and use only a fraction of its fuel mass.” The project’s budget was subsequently reduced dramatically, forcing a postponement of the project, which was ultimately cancelled in 2004. The Russian government began the nuclear energy propulsion project back in 2010, providing over $17 million dollars as an initial investment.A further $247 million dollar investment is expected during the next phase to complete the engine. The engine will produce 100,150 kilowatts of energy for up to three years at normal capacity.